SSal and I have been married for more than 24 years now. During that time we've had our share of "disagreements", some louder than others. One of the loudest came the Monday before our wedding. Church booked, invitations sent, reception menu set. Or so I thought. As many of you know, once the male has "popped the question", his function and position in wedding planning effectively evaporates. A groom is essentially like a kitchen fire extinguisher, everyone knows you should have one, but keep it out of sight until it's actually needed. For four months the menu had been agreed upon, a choice of forgettable chicken and rice or vapid beef with twice-whipped potatoes, everybody gets broccoli. Four months, right there on the menu, broccoli. The last month of wedding planning is a death march; truly a victory of hope over experience. By the last week any and every issue is stressful and ultimately pointless. Everything is fodder for World War III. Monday night before the Saturday reception, SSSal calls and tells me, "We've switched from broccoli to asparagus". After having spent 6 months being invisible, ignored, eviscerated and emasculated in the planning process, I'd had enough. This Crab was not having asparagus at his wedding. If you want asparagus at your wedding find another crab, because this ones not coming! It still ranks among the loudest arguments we've ever had. My sister-in-law-to-be had to call up singing "you say tomato, I say to-mah-to, so let's call the whole thing off". In a large skillet heat the oil. When almost smoking, add the onions and garlic over medium-low heat until the onions have wilted, about 8 minutes. Add the mushrooms and season with salt and pepper. 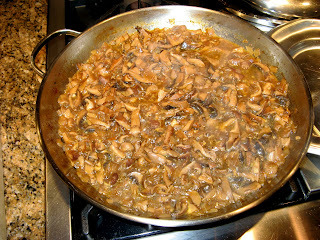 Raise heat to high and saute until mushrooms are tender and all the liquid has evaporated. Remove pan from heat and pour in Marsala. Return pan to stove and allow wine to evaporate, about 3 minutes. Add chicken broth and simmer for 1/2 hour until the sauce has reduced by half. Take the pan off the heat and add the fresh herbs and Parmesan and mix thoroughly. Serve over pasta, this evening we served it over homemade spinach and ricotta stuffed ravioli. I found the Marsala to be exceptionally sweet. I tried squirting a little lemon juice over my pasta and it helped a little. Next time I think I'll eliminate the Marsala and substitute red wine or maybe add a cup of diced tomatoes, we'll just have to experiment. That's it for now crablings, as always, remember, you can do it, you can cook. Oh by the way, we served green beans at the reception, my father-in-law still hasn't forgiven me. Isn't this true, though I still insist on some brussel sprouts at Christmas time....and make OH eat at least one to join in (my) festive fun!! ps ragu looks fab! Cooking with Wine, Lesson 1. Cook with the dryest wine possible because you can always add something to a dish to make it sweeter, but once you add a sweet wine to a dish, you can't take it out. 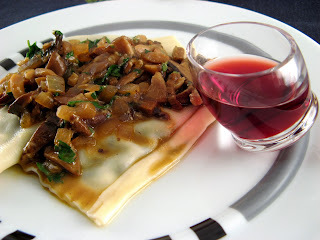 Most American Marsala's are sweet but inexpensive. Real Marsala from Sicily can be any sweetness. Just look on the label for the word "Dry". And yes, they are about 15 a bottle versus 5 for an American copy. PS. I have yet to find a wine that compliments or enhances a Marsala sauced dish. 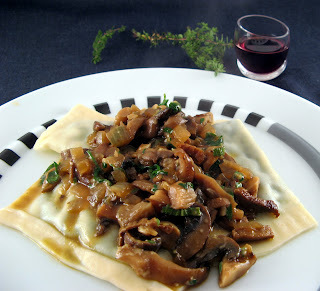 With either veal or chicken or mushroom marsala, pick a wine you like to drink and serve it with the dish.